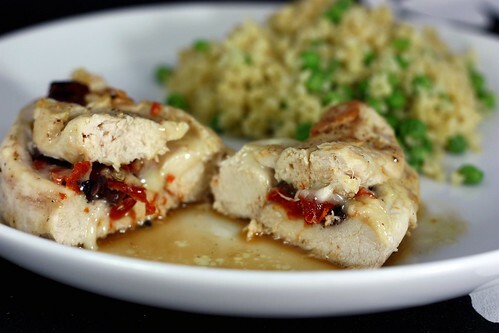 Chicken Stuffed with Sundried Tomatoes, Olives, and Mozzarella – Elly Says Opa! I’m usually pretty great at making meal plans for the week and sticking to them, but lately it’s been tough. I either haphazardly throw together a plan/grocery list only to find out I missed a day entirely or forgot a few ingredients, or I end up not wanting to eat what I’d planned (or don’t feel like cooking in general). In cases like this, my go-tos tend to be either shrimp dishes (quick and easy) or stuffed meat dishes (easy to make with what’s on hand). This particular night, it was a stuffed chicken dish. I always have sundried tomatoes, so that was a no-brainer. As much as I love olives (especially kalamata) I don’t think I’ve ever used them as a meat stuffing, so I decided to add those too. Normally I end up using feta or goat cheese in chicken dishes like this, but we had some sliced mozzarella around, which happened to be perfect (and provolone would be equally great). This came together with almost no effort. While the chicken finished cooking in the oven, I made a quick bulgur side with peas on the stove (which basically meant letting the bulgur do its thing in some chicken broth and then just stirring in some peas at the last minute). A 2 minute pan sauce at the end completed this quick and tasty dish. Cut a pocket into your chicken breasts and fill each one with the sundried tomatoes, kalamata olives, and a slice of mozzarella cheese. Mix together the flour with salt and pepper and the thyme. Lightly dredge the chicken breasts in the flour mixture. Heat an oven-proof skillet over medium heat and add the oil. Once smoking, add the chicken breasts and sear, about 2 minutes per side. Place the pan in the oven until chicken is cooked through, about 15 minutes. Remove the chicken from the skillet and place the pan on the stovetop over medium heat. Add the chicken broth and wine, scraping up the browned bits and reducing the liquid by half. Spoon the sauce over the chicken breasts.